Secrets Of The De Novo Pathway, Part 1: Why Aren’t More Device Makers Using It? Secrets Of The De Novo Pathway, Part 1: Why Aren't More Device Makers Using It? The de novo classification option, introduced as part of the U.S. Food and Drug Administration Modernization Act of 1997 (FDAMA), was developed as a new regulatory pathway for novel low-risk medical devices. Interestingly, this alternative to the lengthy premarket approval process (PMA) has never quite caught on among device makers. In fact, it remains one of the least-traveled routes to market for new devices. Why is this the case? In the first installment of this two-part series, we will seek to answer that question by exploring the history and evolution of the de novo pathway. We’ll also examine some recent changes to the de novo process that should make it more desirable to manufacturers. If you want to bring a new medical device to the market but no similar device exists — in other words, there is no precedent or predicate device — the FDA will designate that device as Class III, the highest the three classes, by default. Class III devices are subject to the rigorous and lengthy PMA pathway. Let’s say, for the sake of discussion, you want to bring a band-aid to market. Hypothetically, there are no other band-aids on the market yet, so the default classification for your regulatory submission is Class III, which would put it in the same category as an implantable artificial heart. You don’t need a lot of degrees after your name to figure out that putting a band-aid in the same class as an artificial heart doesn’t make any sense. So the de novo pathway was created by the FDA to essentially allow a manufacturer to down-classify a low-risk product, even if it is the very first of its kind. The term “de novo” is Latin in origin, and while there are a number of different interpretations of the phrase, my favorite for this particular application is “again, but in a different way.” The basic premise was to bring novel, low-risk medical devices to the market in a new, more efficient way. Submit a full 510(k) application for a new low-risk device to the FDA, with all of the necessary components, including risk analysis and substantial equivalence rationale (more on this in a moment). Wait for the FDA to review the 510(k) submission and eventually determine that the device has no substantial equivalent, automatically categorizing it as Class III. Submit a new application for de novo down-classification. Wait for the FDA to determine whether the device is low-risk. If the FDA classifies it as low risk, the device finally enters the de novo premarket evaluation process. If not, the device ultimately must seek PMA. The statistics support device makers’ reluctance to go the de novo route. The ideal review time stipulated by the de novo regulation is less than 60 days. However, in 2010 the average turnaround time for a de novo device was 241 days. And when you look at start to finish — from the initial 510(k) submission to de novo market approval — the average overall time was about 480 days. That’s about three times the traditional 150 days it takes the FDA to review a Class I (low-risk) device. Once again, there was really no incentive for a manufacturer to do make use of the de novo option. In fact, I would argue that there was a disincentive. Compounding matters, the FDA wasn’t required to provide updates to a manufacturer concerning the status of its application in this convoluted submission process. Before we discuss recent changes to the de novo process and the way the program looks today, I’d like to touch quickly on the matter of risk mitigation, since it’s a key part of the de novo submission process. In fact, I think it’s one of the two most important components of any regulatory submission, along with the substantial equivalence argument. No matter what else you have in your application, if you don’t have a very strong risk mitigation strategy and a very strong substantial equivalence argument, you probably won’t to be successful. Again, we should think of the de novo as a form of down-classification. In other words, you’re telling the FDA, “This device is classified as Class III for no other reason than we’re the first ones to do it, but we don’t think that makes sense based on how the device works or its intended use. We think it should be Class II, perhaps even Class I.” Obviously, to convince the FDA, you have to do everything you can to mitigate that risk. Otherwise you simply are not going to be successful. The good news is that, within the last year and a half, Congress has enacted changes to the de novo regulation that, at least in my opinion, have made the pathway much more attractive for medical device manufacturers — at least for certain kinds of applications. Basically, FDA has simplified that process, streamlining it into what some people are calling “the new de novo process” (even though it’s substantially similar to the “old” de novo). Now all manufacturers of low-risk devices have to do is simply submit a request to FDA for de novo classification, right out of the gate. No longer do they need to first submit a 510(k) and have it rejected. They go straight to FDA and say they have a new device with no precedent, but that it shouldn’t be considered Class III and here’s why. (Again, here’s where a good risk mitigation strategy comes in.) The FDA then has 120 days to issue a classification. This streamlining of the process should, in my opinion, reduce review times and increase the popularity of the de novo pathway moving forward. Of course, only time will tell, but up until about a year ago, there had been a grand total of 80 successful de novo petitions since the program was introduced in 1997. That means the average number of devices brought to the market using the de novo pathway was less than five per year. Over the last year, however, there have been 16 successful petitions — an increase of almost 3x in the number of medical devices coming to market through this seldom-used pathway. I think we’re beginning to see a trend here or at least a potential for a trend that this could in certain circumstances become a more commonly used tool to get our medical devices on to the market. One interesting question to consider is, “How will the third-party review process affect the future of de novo?” It’s a rhetorical question, because it hasn’t happened yet, but looking to the future, it certainly raises the question. For those unfamiliar with third-party review, it’s a path that allows manufacturers making very low-risk medical devices to essentially sidestep the FDA instead. It’s very similar to the notified body system that’s been used in the European Union (EU). In the future, will manufacturers be able to utilize third-party review to get new medical devices successfully down-classified to Class I via the de novo process? If so, it could lead to a very interesting form of predicate, which is one of the things that has really gotten the 510(k) program into a lot of trouble in recent years. This is purely hypothetical, of course, but it illustrates an important point. We must always consider the long-term ramifications of any new regulation or change to regulation, whether it’s for de novo or anything else. Is De Novo Right For Your Device? The bottom line is this: You need to understand all of the different pathways to market that are available for your particular medical device, not just the common ones — not just the 510(k) or the PMA. You need to understand the advantages and disadvantages of each pathway in order to decide which one is best, given your particular situation a given point in time. If you don’t know what the possible options are, then quite frankly, how can you do your job? 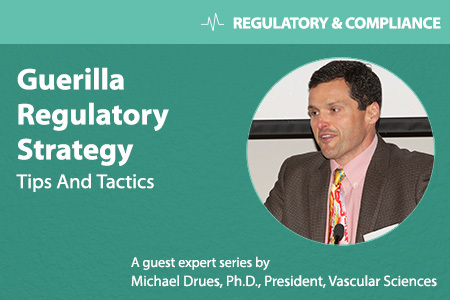 We’ll explore this topic further in the second installment of this two-part series, examining the concept of competitive regulatory strategy and how it relates to the de novo pathway. For a more detailed discussion of these and other topics related to de novo, check out my upcoming webinar De Novo Path to Device Approvals: Tips for Speedy, Successful Outcomes, which will take place on February 24 at 1:00 pm (EST).